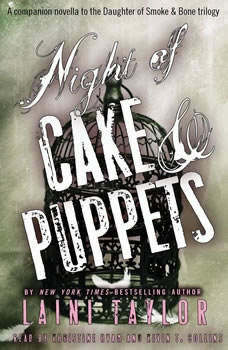 Night of Cake & Puppets: Booktrack Edition adds an immersive musical soundtrack to your audiobook listening experience! * In this stand-alone companion to the New York Times bestselling Daughter of Smoke & Bone series comes the story of Mik and Zuzana's fantastical first date.Petite though she may be, Zuzana is not known for timidity. Her best friend, Karou, calls her "rabid fairy," her "voodoo eyes" are said to freeze blood, and even her older brother fears her wrath. But when it comes to the simple matter of talking to Mik, or "Violin Boy," her courage deserts her. Now, enough is enough. Zuzana is determined to make the first move, and she has a fistful of magic and a plan. It's a wonderfully elaborate treasure hunt of a plan that will take Mik all over Prague on a cold winter's night before leading him to the treasure: herself! Violin Boy is not going to know what hit him.New York Times bestselling author Laini Taylor brings to life a night only hinted at in the Daughter of Smoke & Bone trilogy--the magical first date of fan-favorites Zuzana and Mik. *Booktrack is an immersive format that pairs traditional audiobook narration to complementary music. The tempo and rhythm of the score are in perfect harmony with the action and characters throughout the audiobook. Gently playing in the background, the music never overpowers or distracts from the narration, so listeners can enjoy every minute. When you purchase this Booktrack edition, you receive the exact narration as the traditional audiobook available, with the addition of music throughout.